This is the first time I have played a dice game with my son. 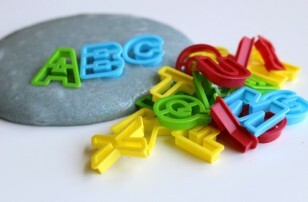 I decided to incorporate fun manipulatives to help reinforce proper one to one correspondence. 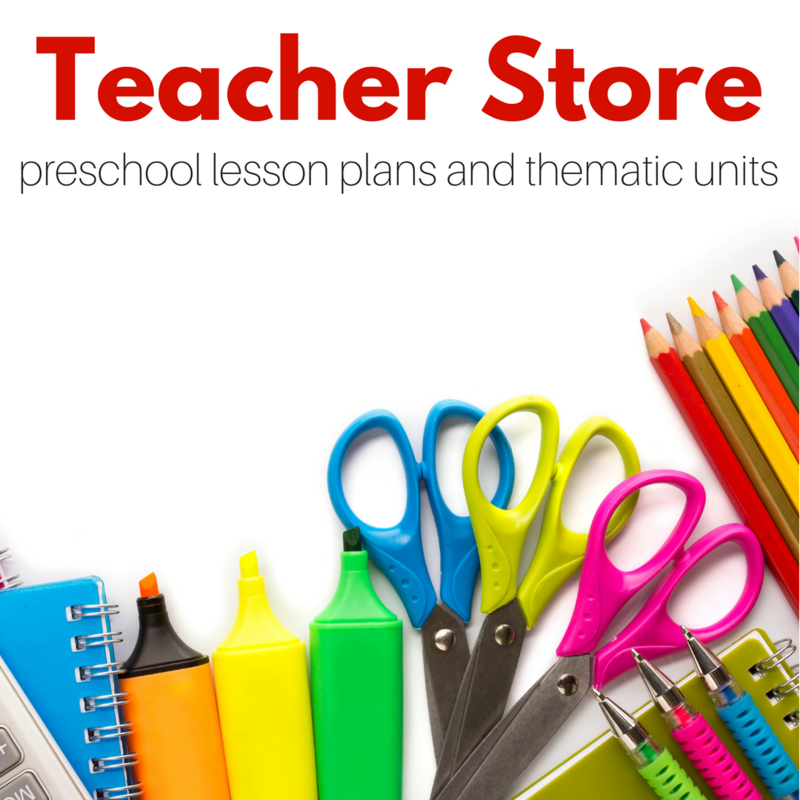 He is still at the stage that most preschoolers stay at for some time where they will sometimes count and re-count objects in groups instead of counting each object only once. 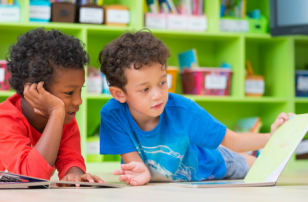 To help teach proper grouping, using manipulatives that they can physically move from one group to another as they count will naturally force them to stop. This gives them a chance to be successful with little parental/ teacher involvement and develops pride and confidence in their own abilities! Also frogs and snakes are fun! Gather your materials. 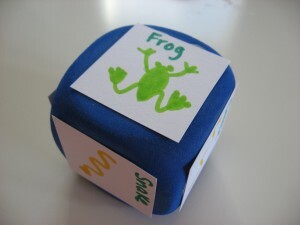 I am using 2 over sized dice ( you can use just one die to keep it simpler), some card stock, scissors, double stick tape, markers, plastic frogs and snakes, and 3 containers. Start by cutting the card stock into a size that will cover your die- if you are using small dice you can simply use little stickers. It’s really not a must to have a 2nd die with the animals , I decided to use both to give the activity some variety. Using just one with just one sort of manipulative to count would be perfectly fine. If you are using two make 3 pictures for each . Play! 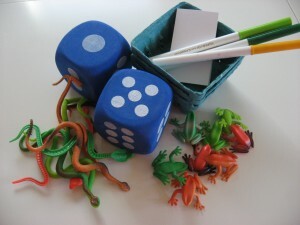 Roll the dice – see which animal you have to count and how many you need to count out! A variation for younger ages would be to ONLY use the dice with pictures and simply have the child sort through the two different animals, then count with you the two separate piles. 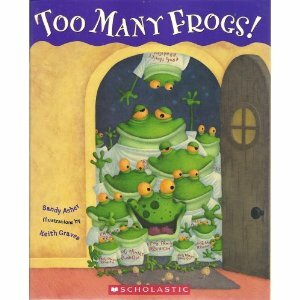 Too Many Frogs by Sandy Asher is a funny tale about a introverted Rabbit and a friendly Froggie who is a little clueless that he is imposing on Rabbit’s politeness when he invites himself over to listen to stories every night. Rabbit eventually breaks down and has had enough when Froggie brings his whole family reunion with him one evening to hear the stories as well. You will like how this story ends , the goofy but warm characters and expressive illustrations. Fribbity Ribbit! 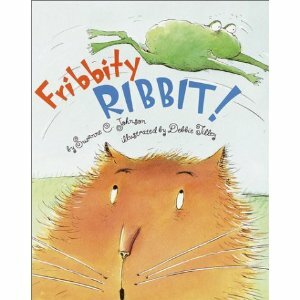 by Suzanne C. Johnson is a simple but deceptively detailed book about a frog that just can’t be caught! The frog jumps from the backyard where a little boy is this close to grabbing him through the house and along the way runs into every family member who joins in the attempts to grab him. I love the different situations each family member is in when the frog interrupts, I particularly like that the grandfather is cooking , if you look closely you can see his cook book is titled “Frog Legs” . There are more frog details on every page, see if you can find them. Little Critter Where Is My Frog? by Mercer Mayer was a wonderful surprise sent to me by the publisher to review. I have been a fan of this series since I was a little girl and was excited to see a lift the flap book for the younger set. 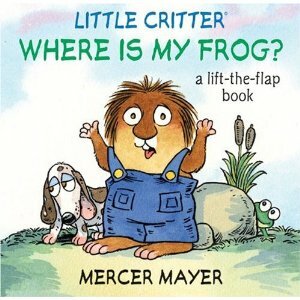 As any fan of the Littler Critter series knows there are hidden spiders, mice or frogs on the pages of the stories but it’s not the easiest for toddlers to find. This format is perfect, story is simple Little Critter goes fishing with his dad , takes his frog along and then the frog goes missing! While lifting the flaps, you find all sorts of animals small and large. Even though my son is able to enjoy much more sophisticated books at three-and-a-half he still finds joy in lifting the flaps, that are so wonderful for younger toddlers to stay interested in otherwise static books. LOVE that song!! Can’t wait to teach it to my daughter!! Love it! .-= Scott´s last blog ..Mothers Day =-. Thanks Dawn 🙂 it’s been a favorite of mine since I learned in it 1988 at camp. Scott- what a great idea I have never heard of that and yet it’s so obvious, thanks for sharing. Yay, I love math games. Thanks for this! I thought since you included a list of froggie themed books and songs, I would post a link to my Frogs and Fireflies iPhone/iPod Touch game. Hope you don’t mind! 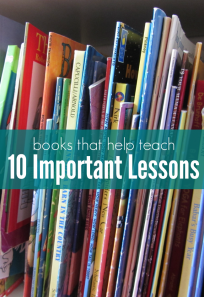 It isn’t a math game, but it is educational. It’s based on color mixing theory. Great idea! I love how you turned the second die into snakes and frogs. 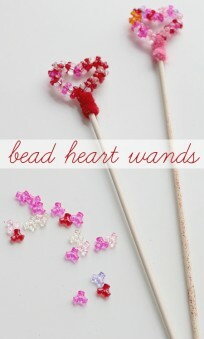 Cute idea and very user friendly project! .-= crystal´s last blog .. =-. Great idea! 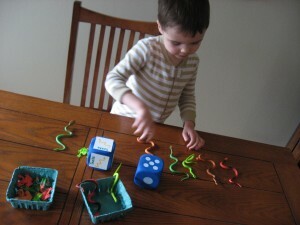 I’ve been on the look out for more math/science related activities for my 3 1/2 year old. Now, I’ll be on the look out for oversized dice just for fun! Hi! I’m new to your site but I wanted to pop in and say thanks for this game and the song. My little one has been sitting on my lap cracking up making me watch it over and over again because she loves it so much. We will definitely be singing this a lot together and we can’t wait to see what other songs you have in store for us. Thanks for sharing! .-= Maranda´s last blog ..The Pioneer Woman’s Cinnamon Toast =-. 1. 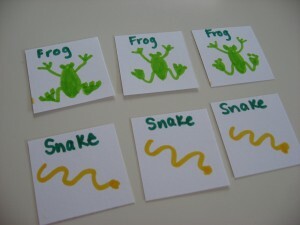 “My” preschoolers (long-term sub) LOVE the frog song. I learned it last time you posted it and it’s a hit with everyone. 2. Another dice-game idea. Get some D&D dice (you’re near Seattle so I hope that makes sense to you) and play candy land with dice instead of cards. Playing with a d12 (12sided die) makes the game go a bit faster and focuses on counting instead of colors. I think next time we’ll use a d20. i love your site! 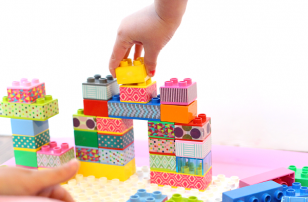 so many simple wonderful ideas! we did the dice game yesterday tho with a variation. 1 die with 1 pile of plastic dinosaurs and one of little people. 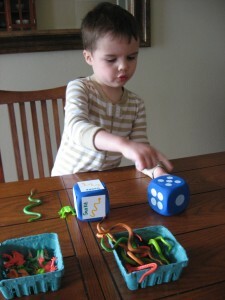 when he would roll the die, i would call out “dinosaurs” and he would then do the counting of those. this went on for a while–10min is long for this boy! so thanks for giving me such a fun and easy game! What a great and simple variation! What a great game. I just picked up some of those same dice yesterday. My 3 yo ds will love this. So of we go to have some fun. Thanks for sharing. .-= Jen´s last blog ..Fun Flea Market Finds =-. Is the song on this post listed on the “songs” page? I didn’t see it…but then, I don’t know the name of the song. My daughter asks for it every day and apparently it’s not good enough when I do it for her. She still wants you to do it. LOL! Thanks again for sharing! .-= Maranda´s last blog ..Spicy Chicken Shawarma =-. Not yet – I added the bulk of the songs on Sunday then added a few more yesterday … and will add more today 🙂 It should be up today though!